Experts recommend that adults try to consume 30 grams of protein with every meal. 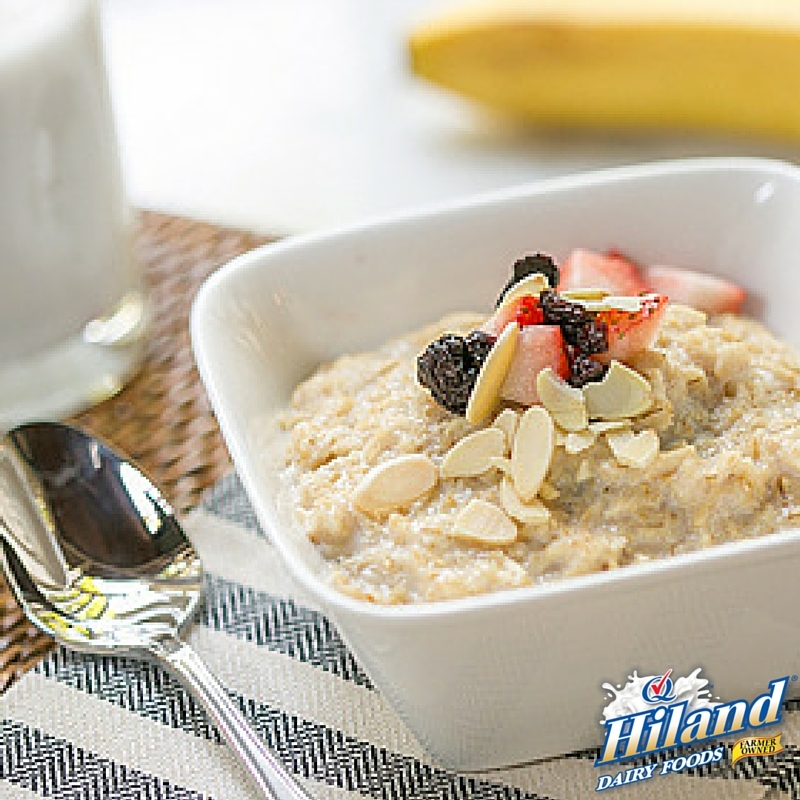 Getting to that magic number 30 can seem daunting…until you realize that in many cases, all you need to do is ‘Just Add Hiland.’ A glass of Hiland Dairy Milk here or a scoop of Hiland Dairy Cottage Cheese there can pump up the protein in a way that’s not only nutritious, but delicious too! In fact, check out this tasty recipe that packs in 25 grams of protein. This morning starter is as simple as it is delicious. If you’ve got 10 minutes, you’ve got time for a breakfast that’ll put you on the right track all day long! Combine 1 3/4 cup milk, oatmeal, brown sugar and cinnamon in a saucepan and bring to a boil over medium-high heat, stirring often to prevent boiling over. Cook until thickened, about 5 minutes. Divide oatmeal between two serving bowls and top each with strawberries, cherries and almonds. Serve each with 1/2 the banana and an 8 ounce glass of milk. You’re in luck! You can find a whole array of recipes that are higher in protein on HilandDairy.com. Recipe and image courtesy of www.milklife.com. © Copyright 2018 Hiland Dairy. All Rights Reserved.